West Africa-focused gold miner Endeavour Gold’s 90%-owned Houndé project, in Burkina Faso, has entered the first phase of construction after the company’s board took a construction decision, the company announced on Monday. The Houndé project was expected to deliver average production of 190 000 oz/y over a ten-year mine life at an all-in sustaining cost (AISC) of $709/oz, based on current reserves. The TSX-listed company advised that, during the first four years of operation, Houndé would produce an average of 235 000 oz of gold a year, at an AISC of $610/oz. Endeavour said that with all permits in hand, it had started early earthworks for the $328-million project. 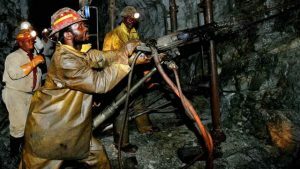 “Once in production, it will become our flagship low-cost mine and will rank amongst West Africa’s top-tier cash generating mines,” stated Endeavour CEO Neil Woodyer. Endeavour planned to fully fund the Houndé project from its expected pro-forma cash position after completing the acquisition of True Gold, the mine equipment financing, and the undrawn portion of its revolving credit facility. “However, rather than draw on our revolving facility, our objective is to fund the remaining capital needs from free cash flow. We have, therefore, prudently implemented a short-term gold revenue protection programme to secure and de-risk the necessary cash flows, providing comfort even if the gold price were to fall to $1 000/oz,” Woodyer advised. The project was designed as an openpit mine with a three-million-tonne-a-year gravity circuit/carbon-in-leach plant.